There's more to life than searching dungeons for adventure and loot . . . like exploring forests, mountains, and plains for adventure and loot! However, information on the great outdoors, and the perils and possibilities thereof, has been scanty -- until now. 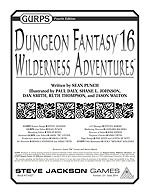 GURPS Dungeon Fantasy 16: Wilderness Adventures is the definitive guide for both crypt-crawling delvers looking to broaden their horizons and rugged heroes who call the wilds their home. Written by GURPS Dungeon Fantasy mastermind Sean Punch, this sourcebook features information on designing heroes that can survive the outdoors (either as permanent residents or temporary visitors), new equipment, detailed rules for tasks and dangers, and extensive insight to incorporating wilderness locales into your campaign. Whether you're using overland treks to spice up travels from one dungeon to the next, or are looking for whole new realms of excitement, this meaty supplement is sure to provide ample ammunition for adventure. Download it today, only from Warehouse 23!